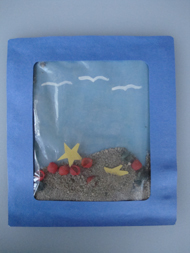 Kids can spend some time at the beach by making their own Sandscape, complete with real sand, shells, starfish and seagulls! 2. Cut out the template and trace it onto a piece of construction paper (we used dark blue). On a sky blue piece of paper trace around only the outside of the rectangle to make the solid background. 3. With the longest side of the rectangle running vertically, paint on some white seagulls onto your blue background paper, both on the top and the bottom (that way it will look the same no matter which way you turn it) You'll want to paint your seagulls between 1½" - 2" from the top so that the top boarder doesn't cover them up! 4. Cut out star fish from yellow construction paper. Color your macaroni by placing a few into a baggie and adding 2 drops of food coloring. Seal the bag and squish it around until the macaroni is covered. It will only take 1-2 minutes for it to be dry and ready to use. 5. Add 2 tablespoons of sand into the baggie and add your shells and starfish. Seal the bag. Turn your seascape upside down and right-side up and it will look the same!